National Parks throughout the United States feature landscapes that are topographically rich and can tell a story about our home – the living Earth. The western United States in particular is the location of multiple National Parks (Figure 1) that are experiencing major changes right now, even as you read this sentence! Two dominant forces control the way the landscape looks in the western half of the United States: subduction and continental rifting. If you ever travel to the state of Nevada, you’ll be standing directly ontop of a continental rift zone called the Basin and Range Province. The Earth is divided into many different tectonic plates, like puzzle pieces, that fit together and shift across the surface of the Earth through time (Figure 1). These tectonic plates float ontop of the underlying mantle , which is composed of more dense material, primarily molten iron and magnesium rich silicate rocks. Tectonic plates meet at plate boundaries, where exciting geological processes occur. Three plate boundary types include: convergent, where tectonic plates collide; divergent, where tectonic plates pull apart; and transform, where tectonic plates slide past each other. The western half of the United States is dominated by continental rifting, where a new divergent plate boundary may form in the future. This area is referred to as the basin and range province (Figure 2). Continental rifting occurs in a zone when a continental plate, like North America, is being ripped apart into two plates, resulting in a rough terrain of down dropped blocks of earth. Further to the west, the Cascade Mountains form a chain of volcanic summits that reflect another primary process that shapes the western United States. Some convergent boundaries are referred to as subduction zones. These are areas where a thin and dense oceanic plate is forced down into Earth’s interior by an overlying thick and buoyant continental plate (Figure 3). Just that is occurring off the western coast of North America. An oceanic plate, called the Juan De Fuca plate, is diving beneath our feet, and leaving it’s footprint on Earth’s surface as it’s sweat melts continental rocks and forms the volcanic Cascade Mountains. or chain of mountains that become volcanically active intermittantly as the process of subduction continues. Figure 4: A close-up map view of the western US, where the continental rifting and subduction leave their mark through National Parks and Monuments. Lava Beds National Monument is located in North-eastern California next to the Medicine Lake volcano. Lava Beds National Monument is located in Northern California, and is nestled between the Basin and Range province to the east and the Cascade Mountains (a series of subduction-related volcanic mountains) to the west (Figure 4). The Monument sits on the flank of a large shield volcano and is unique because it has been impacted by geologically recent volcanic activity related to both the Cascadian subduction and basin and range rifting. A series of volcanic outlets surround Lava Beds National Monument, supplying the area with a variety of volcanic products such as lava flows, cinder cones, lava tubes, and lava domes. Lava flows in this area are Pleistocene to Holocene in age (figure 5), the most recent being 1100 years old, and are typically basaltic- andesite in composition. Figure 5: The Geologic timescale, dividing the life of the Earth into a series of Epochs, Periods, Eras, and Eons. Although not directly inside the park, Medicine Lake volcano has provided Lava Beds National Monument with primarily basaltic composition lava flows that have left their trace as lava tubes and lava flows. The Medicine Lake volcano formed about a million years ago and is considered one of the largest shield volcanoes in the entire Cascade Mountain range. A shield volcano has a low and broad shape that is controlled by the abundance of low viscosity lavas that have erupted from it's summit and flanks. These low viscosity lava are thin and runny, like maple syrup, and can therefore travel long distances from their source. A few lava flows from Medicine Lake have been more viscous, like the famous “Glass Mountain” obsidian flow that was perhaps similar to the consistency of molasses, having a high silica content and oozing slowly down the volcano caldera 885 years ago. Some of these flows produced ash fall that blanketed Lava Beds National Monument with pumice hundreds of years ago. There have been many other sources of volcanism for Lava Beds National Monument that are related to the huge Medicine Lake volcano. For instance, lava flows also exist just outside of the Medicine Lake caldera and extend into the Monument boundaries. Over 200 vents exist within this area that trend roughly north-south, illustrating the direction of tensional forces that are actively pulling North America apart. In general, these vents produce lava spatter cones and flows including high viscosity lava domes. One such source is Mammoth Crater. Mammoth Crater is in the far south of the National Monument and lies NNE of Medicine Lake volcano. Most of the lava flows observed within the monument are remnants from Mammoth Crater eruptions. It is also primarily these lava flows that have provided the monument with its 400 or so lava tube caves (figure 6). Eruptions that occurred 30,000 to 100,000 years ago left broad swathes of lava across the Monument. The lava tubes formed as the outer layer of lava cooled and solidified into rock, leaving the lava underneath to flow freely while maintaining relatively high temperatures (see the Lava Tubes Volcano World page!). These lava tubes acted as conduits through which lava was transported eastwards through the Monument until the eruption from Mammoth Crater ceased. 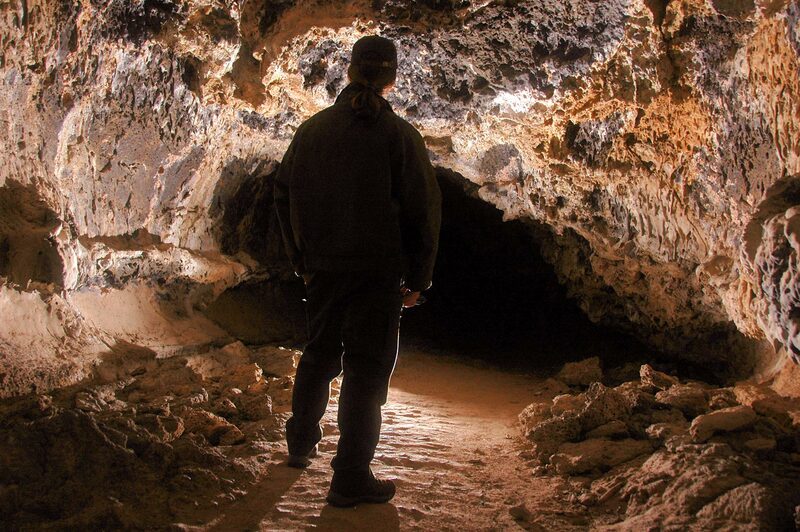 Today, a network of interweaving lava tubes is left behind in Lava Beds National Monument that can be explored like caverns along the Monument’s “cave loop drive”. Four other prominent lava flows are visible in Lava Beds National Monument. The Schonchin flow covers the entire center of Lava Beds Monument. The Schonchin Butte (Figure 7) erupted this lava flow about 30,000 years ago out of a cinder cone that also spewed spatter and ash. Devils Homestead flow and the Ross flow are located in the western portion of the Monument. Devils Homestead flow (Figure 8) originated from Fleener Chimneys, another spatter cone that grew by the accumulation of projectile blobs of lava. Devils Homestead is considered an aa flow, basaltic in composition and with a blocky, uneven surface that collected and cooled between 2,000 and 8,000 years ago. The Ross flow is similar, but came from a different spatter cone vent called Black Crater. Lastly, the Callahan flow is the youngest in Lava Beds National Monument. It covered the southwestern corner of the Monument when this basaltic to andesitic lava flowed out of Cinder Butte only 1100 years ago. Lava Beds National Monument Geologic Resource Evaluation Scoping Summary Although none of these lava flows formed the spectacular lava tube caves, they have created interesting and unusual topography that make Lava Beds National Monument unique among other park sites. Figure 7: The Devils Homestead flow located in western portions of the Lava Beds National Monument preents achallenging surface upon which to walk. Figure 8: A large cinder cone, Schonchin Butte, stands out in the middle of Lava Beds National Monument.